Ron Huldai, Mayor of Tel Aviv, and Jack Bennett, deputy manager of Skolkovo City, represent different strategies aimed at emulating the success of Silicon Valley in becoming a global innovation center. With the medieval streets of Jaffa less than a mile away, Tel Aviv doesn't immediately come across as the next technology hub. However, it has been building successfully on Israel's status as the "start-up nation" to attract scores of innovative entrepreneurs over the past few years. According to Ron Huldai, the key is flexibility. Speaking before his talk at the New Cities Summit in Paris this week, Huldai explained: "Start-ups are extremely high-risk and fast-paced. They're not always keen to enter a long-term lease on offices or invest in office furniture." Tel Aviv has come up with a spatial strategy. According to Huldai, "Tel Aviv has developed co-working space as a solution to providing start-ups with shared office facilities they can rent from one month to a year until they are ready to take on their own space. Furthermore, the co-working space provides a synergetic community that is crucial at this stage." Developers of Skolkovo — an unbuilt prototype for a new city just outside Moscow — have taken a more radical approach. They envision a full-fledged "innocity" that could become an open-source blueprint for future urban development. The city is expected to house more than 30,000 workers when completed later this decade. The multi-billion dollar project has been heralded as a sea change for Russian urban planning. "We strongly believe, based on our research over the past several years, that to innovate effectively you need to be living where you are working," said Skolkovo deputy city manager Jack Bennett. "So we've worked closely with CISCO to integrate housing with a technology park based on their Smart+Connected Communities initiative, which will help provide the services needed for comfortable urban living." While the government of Tel Aviv has been helping individual start-ups take root in Israel's established technology industry, Russia is attempting to build such an industry from the ground up. This has prompted a new openness to working with partners from around the world. "What the Russians understand is that to innovate in today's world you need to collaborate," Bennett added. "If you look at the 1950s to 1980s, up until the fall of the Iron Curtain, things were based on closed systems. The Russians understand that we need to collaborate on a global scale to make Skolkovo work." 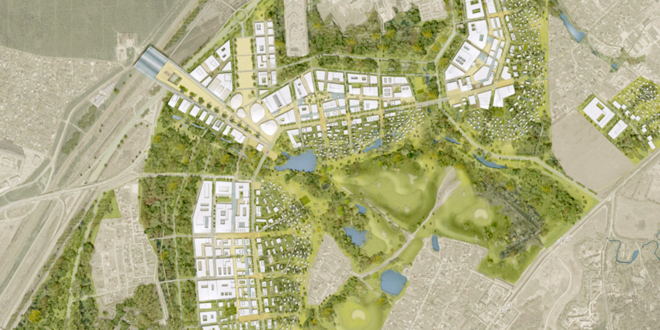 French architecture firm AREP, along with SETEC engineers and landscape architect Michel Devigne, were commissioned to design the master plan for Skolkovo, which revolves around a series of clusters for different tech industries. The aim was to create opportunities for fruitful interaction between people, bodies of knowledge, research projects and businesses, and to adhere to sustainable development principles. Bennett sees the "smart city" cluster environment as the key to cultivating innovation. "You are in the environment where all the amenities are at the touch of a finger. If a city is to be competitive and smart it needs to have a strong information-technology infrastructure. It needs the social infrastructure, the commercial infrastructure, the logical infrastructure for people to be successful." Russia's approach is an expensive and risky one, but it offers the advantages of a fresh start. Although entrepreneurial culture in Russia is not as established as it is in Israel, the government can still foster initiatives that are taking place in existing cities. It remains to be seen whether beginning with a blank slate is more effective than focusing on processes that are already happening independently. Tim Clark is a freelance journalist based in the U.K. He splits his time between writing about comedy for his website Such Small Portions and writing about travel, architecture and education.